This course provides 8 hours of classroom training towards the Illinois 16 hour training requirement. It will focus on the Illinois Concealed Carry required curriculum which consists of shooting fundamentals such as grip, stance, breath control, sight alignment, and trigger pull. Nomenclature, care, cleaning, loading and unloading of a ﬁrearm, firearm safety rules, basic handgun operation, and handling of the firearm as well as transporting and storing a firearm are all covered. There is no range qualification for this class - do not bring a firearm or ammunition to class. Students are encouraged to take notes. This course will give 4 hours of the Illinois 16 hour training requirement and was designed specifically for those students who already have 4 hours of credit via a Utah CCW, or Illinois Hunter Safety Card, or another state approved 4 hour credit. It will focus on the Illinois Concealed Carry training curriculum which consists of shooting fundamentals such as grip, stance, breath control, sight alignment, and trigger pull. Nomenclature, care, cleaning, loading and unloading of a ﬁrearm are covered. The permit application and renewal process as well as denial criteria are reviewed. There is no range qualification for this class - do not bring a firearm or ammunition to class. Students are encouraged to take notes. This course provides 8 hours of training towards the Illinois 16 hour training requirement. It will focus on State and Federal law consisting of storage, carrying, and transportation of a firearm. This course will also focus a large portion on Use of Force as well as range qualification; (70% or better with 30 rounds at distances of 5, 7, and 10 yards). The students should bring a firearm (revolver or semi-automatic – please no single action revolvers), eye and ear protection, 1 box of ammo, and 3 magazines if you have them. These items may be available at the range for a small fee but it is not guaranteed. All students must pay the range a $10 fee. Illinois CCW livescan electronic fingerprinting will be available during class to students at a cost of $40. Students are encouraged to take notes. There are several variations depending upon your situation. The state gives credit for certain previous training. You can find their current list of approved credit at here. You can have a maximum of 8 hours credit allowing you skip our Phase 1. If you have over 8 hours of credit, you will still need to take Phase 2. 1. You don’t have any credit –You will need to take Phase 1 and Phase 2. As an option you can take the NRA Basic Pistol (8 hours) in place of Phase 1 or you can take Utah CCW (4 hours) plus the Phase 1B (4 hours) in place of Phase 1. 2. You have an Illinois Hunter Safety Card – You can either take the Utah CCW or Phase 1B. 3. You have a Utah CCW – You can take Phase 1B (4 hours). 4. You have a DD214 and/or you are prior law enforcement – You need to take Phase 2 even if you have other additional credits. 5. You have a Florida CCW with a class certificate as proof – You can either take the Utah class or Phase 1B. 6. 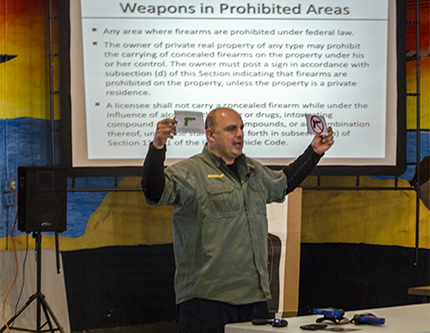 You have taken the Chicago Illinois Firearms Safety Course – You can either take the Utah class or Phase 1B. The class certificate from either Phase 1 or Phase 2 will also be accepted to apply for your Florida CCW. We often offer the Florida packets including application, photo, and ink fingerprints to our students during the Phase 2 class for only $5. If you are new to shooting, or don’t shoot often, then we suggest you take the NRA Basic Pistol class in place of Phase 1. The classes are kept smaller for more personal guidance and it gives more detailed information of firearms as well as incorporating both dry firing and range time in preparation for the Illinois CCW range qualification.